We’d love your help. Let us know what’s wrong with this preview of Project-Based Homeschooling by Lori McWilliam Pickert. To ask other readers questions about Project-Based Homeschooling, please sign up. My oldest son is currently in school due to some life circumstances, and that's kindergarten, so we haven't officially homeschooled yet. When we do, we'll more than likely be unschooling. I find the central idea(s) of this book interesting and worth considering for anyone on the homeschooling spectrum. For that reason I'd probably recommend this book to others, but that's honestly for lack of a better book to recommend on the subject. Unfortunately, the book lacks a great deal in its presentatio My oldest son is currently in school due to some life circumstances, and that's kindergarten, so we haven't officially homeschooled yet. When we do, we'll more than likely be unschooling. I find the central idea(s) of this book interesting and worth considering for anyone on the homeschooling spectrum. For that reason I'd probably recommend this book to others, but that's honestly for lack of a better book to recommend on the subject. Unfortunately, the book lacks a great deal in its presentation of the concept. I mean, ok, I get that the author believes that a kid will benefit more from a self-directed project-based education versus traditional schooling or homeschooling. I get too that the author wants me to have tons of materials at the ready, and that I'm to have a light touch of involvement, and show I value the work and the process. Ok. But that's about all I get. Those points and similar ones are repeated not only throughout the book but multiple times over any given two-page spread. And that's the problem. The information that *is* given is repeated so much that the book becomes tedious to get through, and information that is needed to flesh out the topic is simply not there. I think this would have made for a solid article if trimmed down, but some editing and additional info is needed for it to succeed the way it could as a book. • more on why an unschooler might benefit from pushing this kind of structure on a kid -- something that typically goes against the unschooling philosophy. The author does suggest that unschoolers should do this though, just doesn't say much on why or how to make the transition. • is making something really a necessary part of learning? And is that kind of learning really a necessary part of life? • how does one make this a part of routine if they've otherwise never imposed a routine or goal to their child's work? • how on earth does anyone give their child full access to all these materials if they also have a toddler wandering around the same space? The answer is not there, but I'm hoping it's not that I have to be non-stop managing my 3yo, overseeing, directing, and redirecting everything he does during waking hours. That's not for me. • the on-hand materials recommended seem to be virtually only art-based. Is this intentional? Reflective of a bias? For a purpose? What about having science/math/electronics/engineering materials at the ready? Woodworking? Music? Cooking? • how does anyone have the space for offering all these materials at once and all the projects that result? • it seems that I'm never to put myself forth as an information source to my child. What if I'm an expert in their area of interest? Or if not, why not begin with the knowledge I have? • how will they know that information sources exist if I never tell them about them? The library? Friends/family? Local experts? NASA? Food network stars? If I ask my 5yo where we should look for information, he's not going to know the options we have out there. • How do I model "doing" and project-based living in my own life? I mean literally what would that look like? For one thing I'm lamentably a thinker and not a doer, so I'd like to do more (as suggested) and would appreciate tips, but as far as project stuff, when I find a new topic I'm interested in, I'll read about it, watch about it, sometimes talk about it, but I'm not going to paint about it or sculpt about it, I'm probably not going to write about it either. And I'm an artist. I'm going to recreate faces, animals, and landscapes I find interesting, striking or moving, but I'm not going to make art about Leonardi DaVinci or Pompeii or nutritional science. • there were a lot of conflicting suggestions such as not praising or being coercive and yet paying extra attention to their projects to show them that you value that work (thereby getting them to do more of it) or staying out of things, yet being involved. I understand there may be a fine line, but the book blurred rather than helped me define that line. Every page I read seemed to generate "but how" or "but why" or "please clarify" questions. Really enjoyed this book. For me, as a grown homeschooler and unschooler with ADHD (inattentive type) who is now home/unschooling my own young child, this book provided me with that missing piece I needed. That piece was the process of planning projects and getting through multiple drafts, multiple iterations. Iterations is where it's at. It's how you develop your knowledge and improve your work. There is some good advice in here on how to set up workspace, and ways of supporting children in the Really enjoyed this book. For me, as a grown homeschooler and unschooler with ADHD (inattentive type) who is now home/unschooling my own young child, this book provided me with that missing piece I needed. That piece was the process of planning projects and getting through multiple drafts, multiple iterations. Iterations is where it's at. It's how you develop your knowledge and improve your work. There is some good advice in here on how to set up workspace, and ways of supporting children in their project work. I've noticed big changes in my child's play since I began doing the things suggested, and I am utilizing it for my own projects! Whether you are a creative type who has really struggled with getting in-depth, or you are a technical type who has struggled with isolation or knowing what to do with all the knowledge you've collected, this book can help you (and your family). If I was made to form one critical opinion on Project-Based Homeschooling: Mentoring Self-Directed Learners, it would be only this- the title doesn't capture the all-inclusive nature of this book. What the author accomplishes is a refreshing take on life that can be latched on to by literally anyone, not just home educators, as the title suggests. Lori paints a lovely picture of purposeful daily living. Her ideas on creating an atmosphere of creativity inspire me to look around my home with new If I was made to form one critical opinion on Project-Based Homeschooling: Mentoring Self-Directed Learners, it would be only this- the title doesn't capture the all-inclusive nature of this book. What the author accomplishes is a refreshing take on life that can be latched on to by literally anyone, not just home educators, as the title suggests. Lori paints a lovely picture of purposeful daily living. Her ideas on creating an atmosphere of creativity inspire me to look around my home with new eyes. Lori puts to paper views I find myself already subscribing to, but she does so in a way that draws me in, rather than making me yearn. I find her steps to be attainable just by being aware of my surroundings. I view Project-Based Homeschooling as an invaluable How-To-Do-Life manual. This book will never be packed away, or given away. This is a book you read with highlighter and pencil in hand. The margins cry out to be scribbled in, as Lori urges interests from even the most tired brain! Enjoy! Lori Pickert, the author of the inspiring Camp Creek Blog has FINALLY put her thoughts and instructions for Project- Based Homeschooling into book form. Anybody who has read her blog knows Lori has a gift for motivting, challenging and inspiring parents to give this way of learning and living a chance in their homes. For all the wisdom and call-to-action her blog imparts, the downside to the blog format is that posts are written with a very particular topic in mind with no room to expand (that's the nature of a blog post). Many parents, myself included, have the freedom to click around and we often end up piecing together posts that create an incomplete picture of what project-based learning is. 1) PROJECT BASED LEARNING IS NOT AN ALL-OR-NOTHING APPROACH. I read all the homeschooling books I could get my hands on while my 1st child was still a babe in my arms. So many contradictory methodologies, so many authors telling me their way was the only/best way to educate my child (or so it seemed to anxious mind). Project-Based Homeschooling is the first book on the subject of educating your child I've come across that gives you permission to hold on to whatever methodology you feel is best for your family. She is simply asking us to "devote some time to helping your child direct and manage his own learning." As she says on page 10, "This does not have to comprise your entire curriculum. (Though it can.) It does not have to be the primary focus of your learning life. (Though it can be.)" So if you're fan of Classical, Charlotte Mason, John Holt, Thomas Jefferson Education, Montessori or an eclectic mix, you can continue to educate your children according to their guidelines. You don't even have to be a homeschooler to make project-based homeschooling a part of your life! 2) PROJECT BASED LEARNING IS NOT UNSCHOOLING (although unschoolers certainly can incorporate project-based learning in their homes). Many parents who read Ms. Pickert's blog come away inspired to give what they mistakenly believe project-learning to be, radical unschooling. These parents will do away with rules, structure, routine, deskwork, etc to give what they think is project- based learning a shot, only to end up unhappy with the lack of structure so they swing back in the opposite direction. Again, Ms. Pickert is not asking us to swing back and forth. We can keep our routines, schedules, and drills that add structure to our days. She's only asking that we add project-based learning to the mix. -guide our children through the process of research, representations of his learning (how they exhibit what they've learned), fieldwork and play. -instructions for what to do when we see they are headed in the wrong direction with an idea (ex: your child is attempting to scotch tape a 10 lb steering to his cardboard car). The book has plenty of examples of this kind of learning in action in the form of stories and pictures. At the end of each section she gives you lists of materials and action steps that you can use to start putting these ideas into place in your family's life. She gives you permission and encouragement to go at your own pace and make mistakes along the way. Afterall, the process of becoming a project learning family IS A PROJECT in itself so treat yourself as you should your child. The whole book's tone is one of an encouraging, patient friend who has a passion for guiding parents and children in their own unique learning endeavors. Do yourself a favor and read this book with a highlighter and pencil in hand. You will find most of your pages will turn yellow or pink as you highlight whole pages of quotes you want to remember. Right down any questions you might have and take them straight to the author herself in her project learning forum. If your a "latin-loving classicist" or unschooler, if you feel your child's education will prepare him for college acceptance letters and a traditional job but are wondering how to prepare him for the "new economy" espoused by the likes of Seth Godin, Tara Gentile, Chris Guillebeau, Tim Ferris and others, I encourage you to read this book. When I decided to homeschool my daughter I didn't realize I would first have to unschool myself. Needless to say, it's been and still is an ongoing process, my unschooling. Spotting Project-Based Homeschooling: Mentoring Self-Directed Learners on my library's shelf was serendipitous; I needed the specifics almost as much as the confidence boost. new representations > sharing what we've made with others (p 126)"
Daughter decides what matters. I help her experience a project's beginning, middle and end: "the initial questions and wonderings; the collecting of experiences and artifacts; the research and investigation and making of representations; the reflection and self-assessment; and, the sharing with others." My job is to help her ask her own questions, judge her own work, and decide when she's finished (pp.132-133). "Keys for finishing: Show up. Commit to making the time and using the time; Use small goals to accomplish big goals; Set yourself up to succeed: put a system in place; aim for learned competence (p. 134)." The only downside was most of the book's examples focused on young children in group environments. I would like to see more samples from older children and teens (age 12+) and a closer look at that age group working alone. I've been following Lori Pickert's blog for years, and been wishing for a way to share her ideas in book form. Alleluia, it's here! 1. Project-based learning is based on trust. Traditional classrooms rely on the teacher knowing exactly where students will be (or at least hope to be) by the end of the quarter---the answers are already known. In trying to implement Lori's process into our school's honor program, I learned how essential trust was I've been following Lori Pickert's blog for years, and been wishing for a way to share her ideas in book form. Alleluia, it's here! Traditional classrooms rely on the teacher knowing exactly where students will be (or at least hope to be) by the end of the quarter---the answers are already known. In trying to implement Lori's process into our school's honor program, I learned how essential trust was in allowing children an authentic say in what they learn and how they learn it---trust in our children's eagerness to do real work and in their love of meaningful learning. 2. Project-based learning doesn't have to be all or nothing. I'm guilty of taking a lot of ideas to the extreme as a way to discount them. Yes, PBL is child-led, but that doesn't mean the teacher is just passively following along. I love the way Lori clearly paints the significant role parents or teacher play in supporting and mentoring their students. I'm a big believer in memorization, both math facts and poetry---and my kids aren't going to choose that on their own. But I find that by allowing the majority of their home-learning to be self-led projects, they are much more receptive and enthusiastic about my pet projects. I love the way Pickert stresses the role of environment in a child's learning. Everything from observing their parent as a reader or someone who creates, or FINISHES projects to the table space and wall display and quality art materials---it all communicates what we value to our chidren much more loudly than anything we could say in words. I must admit I was excited about PBH but wondering if there would really be anything new within the pages. From the moment I cracked the cover, PBH drew me in. Before PBH we did a lot of child led learning, much investigating and research, but I was never sure how to take all that information and research and do something with it. Since reading PBH, we've designated work areas for the kids and I've become better at stepping back and facilitating their research/projects rather than actively drivin I must admit I was excited about PBH but wondering if there would really be anything new within the pages. From the moment I cracked the cover, PBH drew me in. Before PBH we did a lot of child led learning, much investigating and research, but I was never sure how to take all that information and research and do something with it. Since reading PBH, we've designated work areas for the kids and I've become better at stepping back and facilitating their research/projects rather than actively driving their research/projects. This has definitely given a boost to our enthusiasm and curiosity. A book that fills a definite gap in the homeschooling methodology world. I would have liked to have had some more practical advice included, especially about how to make time for project work, how to get kids started on projects, how to keep a journal/how to do documentation (examples and different ways to do it), and how to do project work when you don't have the "large" space she often mentions. For instance, our 8 kids homeschool in our eat-in kitchen. How to set up a space in that kind of en A book that fills a definite gap in the homeschooling methodology world. I would have liked to have had some more practical advice included, especially about how to make time for project work, how to get kids started on projects, how to keep a journal/how to do documentation (examples and different ways to do it), and how to do project work when you don't have the "large" space she often mentions. For instance, our 8 kids homeschool in our eat-in kitchen. How to set up a space in that kind of environment? I think the ideas in this book are great for all parents, not just homeschoolers, but I didn't love the book. Maybe it's because I've been reading about this stuff for several years and it's not new information. It also seemed like the same concepts were restated over and over within the book. I would have liked to see more examples of actual projects she has done with kids rather than the general guidelines to keep the workspace attractive, materials available, keep a journal, etc. I found it a bit repetitive, but I like the basic idea of letting your child have ownership over their learning. I just can't figure out how to make it work in our tiny home - I don't have space for tons of art projects to be going at all times with all the supplies out and at the ready. As with all things, I'll take what I can from this and dismiss the rest. Good topic but could use a more flexible approach for parents. I agree with the author that children should have opportunities to follow their own passions. It's why I wanted to explore PBH, but I don't agree with the "make it as easy as possible for them" approach. I'm not trying to stand in their way. Far from it, but I think it's good for them to learn how to work for things, including what they want to learn. Life has challenges and obstacles, and sometimes a true passion is one that makes i Good topic but could use a more flexible approach for parents. I agree with the author that children should have opportunities to follow their own passions. It's why I wanted to explore PBH, but I don't agree with the "make it as easy as possible for them" approach. I'm not trying to stand in their way. Far from it, but I think it's good for them to learn how to work for things, including what they want to learn. Life has challenges and obstacles, and sometimes a true passion is one that makes it despite those obstacles. I also work from home, have three kids, and don't have unlimited time or resources to provide a different setup for the kids every time they have a whim to learn something new. Even though, they are all over 10, they still do this: beg for something and then forget about it 10 minutes after they have it. I definitely follow the philosophy that if something is really important to them, they will keep asking and work for it. They are clever enough to figure out what to do with a basic set of art supplies, science tools, and trips to the library. And they can also save for the really important things or work out a deal with us to go halvsies (such as on a laptop). This book is incredible. In addition to teaching how to do project-based homeschooling it's like a manual on how to live. It's going to make a huge difference to anyone reading it. I can't recommend it highly enough. It's like the author is taking the reader gently by the hand and calmly and encouragingly leading them through the approach. It's encouraging, it's inspiring, it's incredibly instructive. It was a joy to read. This book is overflowing with ideas for any parent who'd like to encourage more self-directed learning in their kids. While I don't homeschool, I do want to create an environment that fosters learning, creativity, etc. My best take-away from this book was to rework our kid workspaces, so that they can more easily leave their work visible while in process and even after completion. Whether you homeschool or not this book has something to teach you about how to raise thinkers and doers. It has changed the way I think about education and my expectations for both of my kids. Kids need open time to dig deeply into their own interests. Make that time and you will be amazed at what your kids want to know and can do. Great book! A whole new way of approaching projects with a little one. After reading this book I gave my son a box and asked what should we do with this? We built at camel, a transformer and a lion. It was interesting to take direction for him and allow him control over his project! I loved the book. It gave me tons of inspiration and made us choose for project based homeschooling. Really solid logic that led me to a new place in homeschooling. Just wish it would have included a list of possible starter project ideas. This book was so helpful in helping me see more clearly how to support my son in his learning. Highly recommend! I've decided to rewrite my review as I felt my original one didn't really reflect my Feelings on the book, but was responding to what others said, rather than my own views. In short, I really enjoyed this book. It deserves 5 stars and there are some great ideas that I have to take away, think about and put into practice and that is what a good book needs to do. This book is a great guide for project based learning, for kids and life. I like the steps Pickert breaks down to be active in your child's project while still keeping it theirs. I'm looking to add this style of learning to our unit based homeschool approach. A great read for a fresh perspective on what it means to be a lifelong learner. This book wasn't revolutionary, relative to what we have been doing in our home, but it did remind me of a few things I wanted to try out. This would be a good resource for someone who wasn't already doing these kinds of project-based explorations instinctively. Good, but a lot redundant. Too many words to make the same points. I did find value in her lists. I copied many of them down and plan to post them in my home as a source of reference for myself and my kids. Useful information as well as useful reminders. Very quick read. You do not have to be a homeschooler in order to get value from this book. I agree with other reviewers that it lacks instruction on how to get your child to identify that first project. Concrete, secular. Beautiful writing that conveys clear ideas. Worth it for the brilliant introduction alone. Really the best homeschooling book out there, for both its quality ideas and writing. I'm fairly torn on my review of this one. I've been reading Lori Pickert's blog for a couple of years, and I'm embarrassingly groupie-like in my admiration of what she has to say. But I've gotten more out of her blog and her discussion forums than I did out the book. The idea of project based learning, as I understand it, is that you don’t go to your kids, and say, “This month we’re going to be learning about the human body!” Or even, “Hey, I see you’re really interested in dinosaurs right now. T I'm fairly torn on my review of this one. I've been reading Lori Pickert's blog for a couple of years, and I'm embarrassingly groupie-like in my admiration of what she has to say. But I've gotten more out of her blog and her discussion forums than I did out the book. Instead, if your kid is interested in dinosaurs, you let them take the lead and tell you what they’d like to do with their dinosaur passion. Your job is to be more of mentor, helping them remember what plans they’ve made, providing materials, and gently offering new ideas when they get stuck. The idea is that it’s really valuable to learn how to learn, to be excited about something, to make plans and follow through with them, to overcome obstacles, and that sort of thing. The kid will obviously learn all kinds of interesting, specific things in the course of their project, and if the project is dinosaurs, they’ll probably become a walking encyclopedia of dinosaurs or whatever. But that’s really secondary to the process of learning and making. The book does do a good idea of getting the idea across. But the forums and blogs do a better job of explaining how to make that idea a reality. The problem for me, I think, is that there are few examples of specific projects in the book. I remember reading somewhere that Lori did that intentionally. She didn't want parents reading about a specific project and comparing their own child's real-life project to a hypothetical project in the book. And I get that. But it made it hard for me to connect to what the book was saying. The book tended toward repetitive discussion of abstract philosophy instead. And I'm generally all about the abstract philosophy! But I guess I was looking for a more robust dose of how-to to go with the philosophy. I actually read the book twice, once before we'd started any project-based learning and again after we had a project underway. I found the book more meaningful the second time around, when I was able to mentally apply what she was saying to the actual project my daughter had going. I suspect I would have found the book more helpful the first time if I'd had some representative projects to connect the ideas to. I think the book also could have been served by a section or two on troubleshooting. The forums tend to be overflowing with discussion of, "All he wants to do is play Minecraft! What do I do?" "She gives up on her interests after a day or so. How do I help her go deeper?" "My space is really small. How can I make this work?" The troubleshooting discussions on the forum tend to be really enlightening, both because the answers are helpful and because they're a nice reminder that, no, it's not going to be textbook perfect for you all the time, but that's okay. I would have liked more about what to do when things aren't working. And, finally (This is getting pretty long! ), I would have liked more discussion of projects that are not necessarily completed with art materials. I've never been a let's-make-stuff-in-the-physical-world kind of girl. Maybe my own daughter will be, but maybe she'll be more like me. Anyway, I know that a project can be anything that's a really deep passion, and the output can be anything - a story, a computer program, a really excellent loaf of bread. But the book sometimes gave the impression that it doesn't count as a project unless art supplies were involved. And I'm pretty sure that wasn't the intention. I think I'm being harder on this book because I've enjoyed Lori's blog so much over the years. If I had been picking it up cold, I think I would have found it really enlightening. But as it is, I'm going with three stars for the actual book, and five stars for what I've read of Lori's book, averaging out to a four. Great read for fellow homeschoolers! We are diving into more interest led learning for the rest of the school year. Great motivation and inspiration. I can see many annual rereads of this. Lori Pickert is an American author living in the Midwest. She founded and ran a small Reggio-inspired school for several years and traveled the U.S. as an educational consultant, training teachers and presenting workshops on child-led education and authentic art. She began homeschooling her sons when they were 4 and 7. 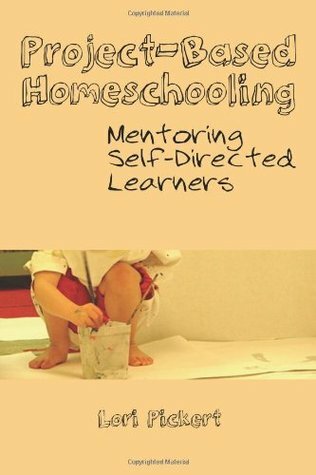 She writes about project-based homeschooling and mentoring self-directed learner Lori Pickert is an American author living in the Midwest. She founded and ran a small Reggio-inspired school for several years and traveled the U.S. as an educational consultant, training teachers and presenting workshops on child-led education and authentic art. She began homeschooling her sons when they were 4 and 7.